How can I configure OS X Mountain Lion to scroll one 'page' at a time? 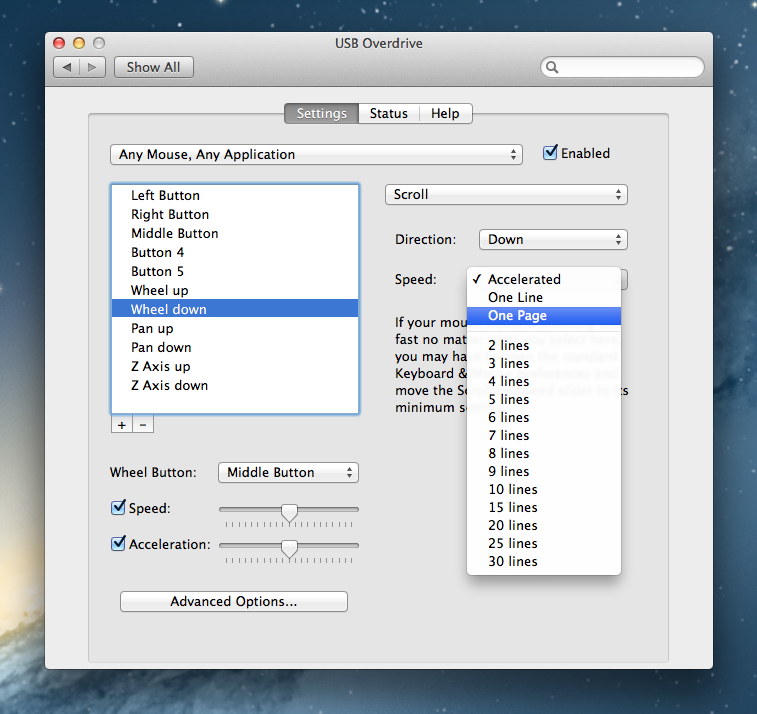 OS X's Scrolling Speed in Mouse preferences doesn't have the effect of what I'm looking for. The default/current behavour is that the first few wheel scrolls is one 'line' at a time. Only when you've scrolled a few wheel clicks in quick sequence does it start to scroll in larger chunks. I have a Logitech MX 510 mouse. The Logitech control panel has no options here either. Are there any Mountain Lion tweaks I can make or is there any FREE software to help? USB Overdrive can do that but it's not free. You could also add a rule like this to KeyRemap4MacBook's private.xml. The behavior when scrolling multiple ticks was a bit weird on the mouse I tested with; it only scrolled a full page about once every 0.5 seconds. You can also increase the scrolling speed with defaults write -g NSScrollWheelMultiplier -float 200. Not the answer you're looking for? Browse other questions tagged macos mountain-lion mouse scrolling . In El Capitan, how can I prevent the Mac bluetooth mouse from from 'carrying' its scroll between different elements on a single page?